Background: Apparently, young people begin smoking for different reasons. for instance, increase the pressure of peers, family attitudes that condone smoking, stress relief, using some drugs or it could be based on many other reasons. Currently, smoking has been involved as a main responsible for approximately 30% of all cancer deaths in developed countries. 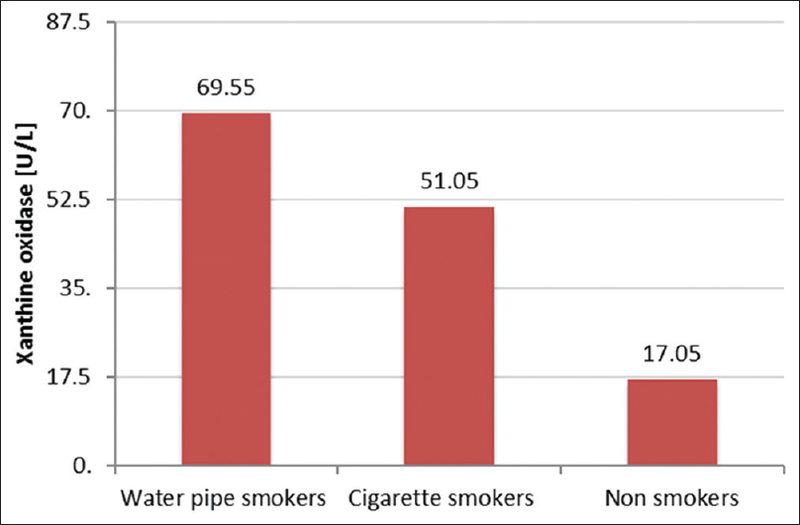 Materials and Methods: The evaluation was to examine the extent of adverse effects of cigarettes and water pipe (WP) smokers on biochemical characteristics in healthy young men smokers. Results: The results were shown a significant increase of the measured hematological parameters (white blood cells, hemoglobin, and platelet counts) associated to WP smoker group. Part of kidney performance was examined under both smoking conditions, and compared to control group, only blood urea levels of WP smoker group were indicated a significant increase (P < 0.05). On the other hand, the results demonstrated that 5'-nucleotidase and xanthine oxidase activities were higher in both smoker groups as compared to nonsmoker group, while glutathione S-transferase was shown a lower activity in WP smokers. Conclusion: Based on these results, it can be concluded that both types of smoking have influenced many endogenous factors which decreased the cellular protection against free radical attacks and that were obvious through the variability of the measured biological factors under smoking conditions compared to nonsmoking group which easily could be result in a list of diseases usually linked to smoking. In recent years, young generations have used to be either cigarette smokers or water pipe (WP) smokers which made this issue becomes prominent in societies, especially in the USA. WP smoking has more effect than the cigarette smoking; each 40 puffs of WP smoke will be equal to smoking about two packs of 20 cigarettes in the same time. The Health Consequences of Involuntary Exposure to cigarette smoke which prepared by the Office on Smoking and Health, National Center for Chronic Disease Prevention and Health Promotion, and Centers for Disease Control and Prevention has estimated of 20.8% of all adults (45.3 million people) who smoke cigarettes in the USA. Smoke contains many chemicals that can quickly irritate and damage the lining of the airways. Even brief exposure can result in upper airway changes in healthy persons and result in more chronic bronchitis symptoms.Oxidant species derived from cigarette smoke and toxic chemicals that combine to form of a long lifetime free radicals are known to promote many changes in the biochemical properties of human nature mainly as vascular disease. Furthermore, it has been reported that cigarette smoke is highly related to the risk factors of neurological disorders which associated with increasing levels of oxidative stress. Free radicals are initiated or catalyzed by smoking through an active redox system that is capable of reducing molecular oxygen to produce superoxide, eventually leading to hydrogen peroxide and hydroxyl radicals. These are then propagated in a chain reaction generating more free radicals and further reaction products from the substrate. Oxidative stress has been identified as a common denominator of many cardiovascular risk factors which is mainly caused by an imbalance between the activity of endogenous pro-oxidative enzymes such as Nicotinamide adenine dinucleotide phosphate (NADPH) oxidase, xanthine oxidase, the mitochondrial respiratory chain, and antioxidative enzymes such as superoxide dismutase, glutathione peroxidase, heme oxygenase, and thioredoxin. Xanthine oxidase is a form of xanthine oxidoreductase, an enzyme that generates reactive oxygen species (ROS) such as superoxide radicals and hydrogen peroxide when it catalyzes the oxidation of hypoxanthine to xanthine, and can further catalyze the oxidation of xanthine to uric acid. Therefore, it might be involved in a variety of pathological states ranging from hyperuricemia to ischemia-reperfusion injury. Its readily donates electrons to molecular oxygen, thereby producing O2− and hydrogen peroxide. This enzyme plays an important role in the catabolism of purines in some species, including humans. ROS can be produced by mitochondria, NADPH oxidase, and xanthine oxidase under hyperglycemia. The source of xanthine oxidase is not completely clear, but increased cholesterol levels have been shown to stimulate the release of the enzyme from the liver into the circulation. On the other hand, ecto-5'-nucleotidase (5'NT) is an enzyme localized on the cell surface and catalyzed the metabolism of the extracellular simple and complex signaling molecule nucleosides into bioactive nucleoside intermediates by hydrolysis the phosphate moiety at carbon 5 of the sugar portions of nucleotides. Pathophysiological alteration of 5'NT becomes increasingly valuable in clinical biochemistry and in the considerable number of diseases due to their metabolic functions. For instance, in nervous systems, 5'NT further to their role as a metabolic compartment of extracellular nucleotides, ectonucleotidase is a multifunctional protein as active catalyze, especially at the early neural development. Gene polymorphisms of 5'NT also reported to have a crucial role in the end-stage kidney disease patient by affecting the development of calciphylaxis. As an immunosuppressive molecule, 5'NT has been reported also to be involved in the responding of the adaptive and innate immune system. It has suspected that 5'NT might inhibit the expression of characteristic microglial anti-inflammatory polarization markers. Recently, 5'NT enzymes have been assessed as a good biomarker for the renal cell carcinoma. Results have indicated that high 5'NT level cells are highly tumorigenic. Further studies reported the roles of xanthine oxidase enzyme in the hyperuricemia and in atherosclerosis and cardiovascular disease. Previously published studies were limited to local surveys; the studies would be more useful if they included an examination to the effect of proposed enzymes on the smoker populations. Due to the presence of these enzymes in most cells also their excess generation of ROS it might cause many damages to different biomolecules and resulting in lipid peroxidation. Thus, the activity of antioxidants and scavengers or the inhibition of the generation of free radicals is important. This study was aimed to investigate the effect of these enzymes' activity as a ROS generates and the response levels of antioxidant manifested by Glutathione (GsH) in young men with cigarette smoking and WP smoking. Blood samples were collected from three groups of 60 cigarette smokers, 60 WP smokers, and 60 nonsmokers (control group) whose ages ranged between 18 and 26 years, apparently healthy. The medical history was taken. None of the participants who had any chronic diseases, history of alcohol intake, and taking potent antioxidant were excluded from the current study. Venous blood samples were drawn about 10 mL of venous blood was aspirated by disposable syringe, 2 mL of this blood was transferred to ethylenediaminetetraacetic acid container tube and then mixed gently using blood shaker to prevent clotting of the blood. The rest of the blood was allowed to clot at room temperature for 10–15 min then, centrifuged for (10) min at (3000 rpm) to separate serum which then transferred into a new tube and frozen at (−20°C). The hemoglobin (Hb) was measured by hematocrit. Serum urea, creatinine, protein, albumin, and uric acid levels were measured by spectrophotometric methods supplied by human diagnostic. The 5'NT activity was measured in serum according to Wood and Williams's method. Xanthine oxidase activity was determined by Ackermann method. The malondialdehyde was determined according to the modified method of Satoh. Vitamin C levels were estimated by Tietz method. Vitamin E levels were determined according to a modified of Hashim and Schuttringer. The total antioxidant status (TAS), Total oxidant status (TOS), and oxidative stress index (OSI) in sera of patients and control groups were measured as previous studies. Serum sodium, potassium, and chloride were measured by Olympus AU2700 analyzer; serum nitric oxide (NO) was determined according to the method described by Navarro-Gonzalvez et al. The Peroxynitrite (ONOO)-mediated nitration of phenol was measured as described by van Uffelen et al. All statistical analysis in the study was performed using SPSS version 21.0 for Windows (Statistical Package for the Social Sciences, Inc., Chicago, IL, USA). The expressive analysis was presented the mean and standard deviation of variables. The significance of differences between mean values was assessed by Student's t-test. The probability P < 0.05 was considered statistically significant, while P > 0.05 was referred to statistically insignificant. Hematological data (white blood cells [WBCs], Hb, and platelet counts) observations were examined by testing the blood serum of the study groups. [Table 1] shows the demographic data of the studied groups. A number of important biochemical factors were also performed to examine their relation to both studied groups. [Table 2] shows these parameters compared to controls. Further analysis was performed; the activity of suggested enzymes (5'-nucleotidase, xanthine oxidase, and glutathione S-transferases) was measured as shown in [Figure 1], [Figure 2], [Figure 3], respectively. To provide important insights, analysis of some oxidation products and antioxidant levels was performed and the results were shown in [Table 3]. Smoking damages nearly every organ of the body, causing many diseases and generally reducing the health of people who are smoke or passive smokers which they suffered from carbon monoxide poisoning. A significant effort made to examine the issue of exposure young men to cigarette and WP smoking. The list of diseases usually linked to smoking are cardiovascular disease, cancer respiratory disease, and many others. Therefore, for environmental and health concerns, young male smokers were a subject of this study. In both smoker types, results have shown a significant association to the measured hematological parameters. The mean values of WBCs were increased significantly in both groups of participants A and B with P < 0.05 and 0.01, respectively, compared to the nonsmoker group. WBC might be increased due to the possibility of chronic inflammation of respiratory tract which results from the defect in releasing catecholamines and steroid hormones under the effect of nicotine or any other derivatives. On the other hand, the mean values of Hb were almost equal in Groups A and B, but it was significantly higher in WP than cigarette smokers compared to nonsmoker groups. In general, the reason behind that could be a compensate mechanism which proposed as a part of increasing the blood intensity due to carbon monoxide exposure that results in an inactive form of Hb (carboxyhemoglobin) with limited oxygen-carrying capacity. Wherefore, smokers preserve higher Hb to maintain the oxygen delivering among two types of smokers regarding the mean concentrations of Hb, and packed cell volume (PCV) could be due to the high-level exposure which associated to the toxic substances in WP than in cigarettes. Furthermore, the Hb and PCV have severed adverse effect on the hematological parameters among study population. It was found that the elevated of PCV and Hb levels were highly recommended to be used as a biomarker of smokers thrombosis causes. The mean values of both Hb and PCV count levels were increased significantly in WP smokers (P < 0.01), which are highly indicate to develop secondary polycythemia in the future based on well reasons reported by. Analysis of serum biochemical parameters showed no significant difference in both smoker groups comparing to nonsmokers except the blood urea concentration of WP smoker group which was indicated a significant increase (P < 0.05) as shown in [Table 2]. Smoking is a common reason which might result in deterioration of renal functions and glomerular filtration rate (GFR). Inefficiency of GFR could lead to detraction the rate of distal tubular flow and in this case will result in increasing of urea reabsorption. Many mechanisms might be involved in renal vasoconstriction and vascular damage. Previously, it has reported that blood levels of catecholamine, arginine, and vasopressin might be increased by nicotine. Further analysis was performed; the activity of suggested enzymes was measured. The results demonstrated that 5'-nucleotidase and xanthine oxidase activities were higher in both smoker groups as compared to nonsmoker group. The values of 5'-nucleotidase activity were 40.5 U/L, 32.55 U/L, and 15.25 (U/L), while the activity of xanthine oxidase over study groups was 69.55 U/L, 51.05 U/L, and 17.05 U/L, respectively, as shown in [Figure 1] and [Figure 2]. The results suggested that these alterations in the activity of enzymes from the purinergic system are associated with an increase in platelet aggregation due to smoking effect. Both enzyme families play a crucial role in the maintenance of thermogenesis and vascular hemostasis, based on the regulation of platelet aggregation. However, smoking makes these enzymes promote changes in their activity. Based on the effect of smoking, increased the activity of these enzymes might be due to increase the generation of ROS. This process enhances the level of Adenosine Diphosphate (ADP) and causes the release of thromboxane A and serotonin, which in turn lead to platelet aggregation. As an anticarcinogens, it is well-known that glutathione S-transferases play an important role as an xenobiotic metabolizing enzyme required for activation the metabolic of carcinogenic effect result from the polycyclic hydrocarbons and their derivatives which presence in tobacco and other smoking substances. This detoxification pathway required a highly activity of the enzyme to make them in inactive form and facilitate their excretion. Therefore, total enzyme activity was measured to examine the effect of smoking exposure. Results were showed a clear deficiency in their activity in both smokers compared to the nonsmoker group as shown in [Figure 3]. Normal activity of glutathione S-transferases is one of the crucial ways to enhance the toxicological defense system, thus likely, exposures to oxidative stress could be highly possible. That might lead to more molecular damage in many cells subsequently to more diseases including cancer. Smoking, as a well-known source of ROS it is an expected result to find a deficiency in the activity of glutathione S-transferases enzyme due to the generation of endogenous ROS during the metabolism of xenobiotics as a result of smoking exposure. Serum antioxidants were compared also among the study groups as needing to elucidate the role of relevant serum scavenging capacity. The clear contributory effects of antioxidants were found toward both types of smoking. Analysis of research results has shown a significant increased in all oxidation products as shown in [Table 3]. Low levels of antioxidants can give rise to high oxidation products. In this study, serum total oxidation status (TOS) and OSI (the ratio of TOS to TAS) levels were significantly higher in both smokers (P < 0.01), while TAS levels were significantly lower in both smokers (P < 0.01) compared to control group. Smoking exposure is one of the most responsible factors considered to be associated with oxidative stress. On the other hand, some individual antioxidant compounds such as Vitamins E and C were determined. As can be seen from [Table 3], both smoker groups reported significantly lower Vitamin C (P < 0.05) than the nonsmoker group, while no significant differences in Vitamin E were found between smokers and nonsmokers, whereas other studies reported a deficiency of Vitamin E through smoking. Many reasons for the discrepant results could be due to the fact that a lipid soluble vitamin E has high affinity to all lipoprotein fractions in man, mainly with lipoproteins which contain (apo B), and most of lipid soluble vitamin will be stored in liver and less in adipose tissue and skeletal muscle. This reason behind why the serum level not changed due to the clinical evidence which confirms increasing the oxidation of alpha-tocopherol (precursor of Vitamin E) when the body in exposure to free radicals. Both vitamins' combination could act with each other as defense mechanisms against oxidation damage. In the same time, it has been known for some time that cigarette smoking reduces blood levels of Vitamins C and E through the defense process can be made into a radical, but the data were less clear. Previous studies evaluated the reactive nitrogen species inconsistent results on whether it is related to nitrate γ-tocopherol in vivo. Increased nitrate and/or nitrite derivatives (NOx) could be another reason to affect the storage Vitamin E not the serum levels. That could be based on the proposed mechanism that reported by Wurzel et al. which suggested increased nitration of γ-tocopherol yielding 5-NO2-γ-tocopherol by exposure to cigarette smoke, while the blood Vitamin E level was unchanged. 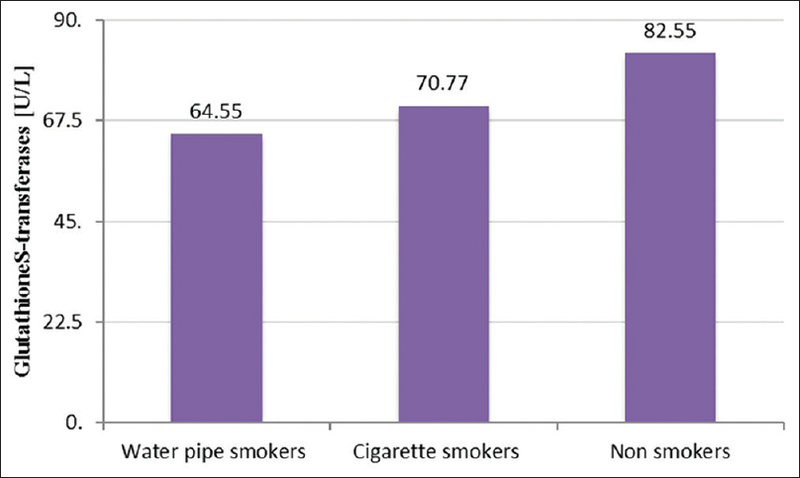 The mean level of NO was significantly higher in WP smokers than cigarette smokers (P < 0.05). The results were agreed with many other studies that reported the association of high NO level with smoking. Furthermore, many researches have been linked between NO and the activity of clinical disease. However, production of NO could be contributed by diet and some treatments (such as treatment with methylprednisolone) also found that the NO production was much higher at sites of inflammation. Wherefore, the levels of peroxynitrite (the more stable markers than NO which result from the reaction between NO and superoxide radical) were measured and it was found that the concentration is about two times higher in the both smokers than in nonsmokers (P < 0.05); peroxynitrite has a long-term action in the chemistry of oxidative which was reported in long details by Ischiropoulosd et al. After a long-term action, smokers with high levels of NO and peroxynitrite are likely to have more complicated than nonsmokers in term of multiple sclerosis, defect in synaptic transmission in motor and sensory pathways, and also a damage in axonal degeneration due to the correlation between the extent of axonal injury and the extent of inflammation. The evidence of prevalence smoking established that smoking is the single greatest avoidable cause of disease and death. The health consequences of involuntary exposure to the smoke have shown that short exposures to active or passive smoke can cause many health problems such as blood platelets to become stickier, damage the lining of blood vessels, decrease coronary flow velocity reserves, and reduce heart rate variability, potentially increasing the risk of a heart attack and many others. In conclusion, the most obvious finding to emerge from this study is that the WP smokers were associated with exposure to toxic substances and produced more of the effects as cigarettes. These results should be used to resolve the associated risks with using of WP. All young smokers must be aware about the potential adverse effects of their habit on cardiorespiratory quality and metabolic levels. Vineis P, Alavanja M, Buffler P, Fontham E, Franceschi S, Gao YT, et al. Tobacco and cancer: Recent epidemiological evidence. J Natl Cancer Inst 2004;96:99-106. Barnett TE, Curbow BA, Soule EK Jr., Tomar SL, Thombs DL. Carbon monoxide levels among patrons of hookah cafes. Am J Prev Med 2011;40:324-8. U.S. Department of Health and Human Services. The Health Consequences of Involuntary Exposure to Tobacco Smoke: A Report of the Surgeon General. U.S. Department of Health and Human Services, Centres for Disease Control and Prevention, National Center for Chronic Disease Prevention and Health Promotion, Office on Smoking and Health; 2006. Teasdale JE, Hazell GG, Peachey AM, Sala-Newby GB, Hindmarch CC, McKay TR, et al. Cigarette smoke extract profoundly suppresses TNFα-mediated proinflammatory gene expression through upregulation of ATF3 in human coronary artery endothelial cells. Sci Rep 2017;7:39945. Choi S, Krishnan J, Ruckmani K. Cigarette smoke and related risk factors in neurological disorders: An update. Biomedicine Pharmacother 2017;85:79-86. Church DF, Pryor WA. Free-radical chemistry of cigarette smoke and its toxicological implications. Environ Health Perspect 1985;64:111-26. Förstermann U. Uncoupling of endothelial nitric oxide synthase in cardiovascular disease and its pharmacological reversal. In: Nitric Oxide, Biology and Pathobiology Book. 2nd ed., Ch. 5. Academic Press, London: United Kingdom; 2010. p. 139-67. Tang Y, Long J, Liu J. Hyperglycemia-Associated Oxidative Stress Induces Autophagy: Involvement of the ROS-ERK/JNK-p53 Pathway. In: Autophagy: Cancer, Other Pathologies, Inflammation, Immunity, Infection, and Aging: Molecular Mechanisms. Vol. 1. Academic Press, London, United Kingdom: 2014. p. 105-15. Zimmermann H. Biochemistry, localization and functional roles of ecto-nucleotidases in the nervous system. Prog Neurobiol 1996;49:589-618. Xu S, Zhu W, Shao M, Zhang F, Guo J, Xu H, et al. Ecto-5'-nucleotidase (CD73) attenuates inflammation after spinal cord injury by promoting macrophages/microglia M2 polarization in mice. J Neuroinflammation 2018;15:155. Song L, Ye W, Cui Y, Lu J, Zhang Y, Ding N, et al. Ecto-5'-nucleotidase (CD73) is a biomarker for clear cell renal carcinoma stem-like cells. Oncotarget 2017;8:31977-92. Chen C, Lü JM, Yao Q. Hyperuricemia-related diseases and xanthine oxidoreductase (XOR) inhibitors: an overview. Medical science monitor. Int Med J Exp Clin Res 2016;22:2501. Wood RJ, Williams DG. Colorimetric determination of serum 5'-nucleotidase without deproteinization. Clin Chem 1981;27:464-5. Ackermann E, Brill A. Xanthine Oxidase Activity, Methods of Enzymatic Analysis. 2nd ed. USA: Academic Press, Inc.; 1974. p. 521-2. Satoh K. Serum lipid peroxide in cerebrovascular disorders determined by a new colorimetric method. Clin Chim Acta 1978;90:37-43. Tietz NW. In: Text book of clinical chemistry, Edited by Tietz NW, WB Saunders Company, Philadelphia, London, Toronto; 1986. p. 960-2. Hashim SA, Schuttringer GR. Rapid determination of tocopherol in macro-and macroquantities of plasma, results obtained in various nutrition and metabolic studies. Am J Clin Nutr 1966;19:137-45. Erel O. A novel automated method to measure total antioxidant response against potent free radical reactions. Clin Biochem 2004;37:112-9. Navarro-Gonzálvez JA, García-Benayas C, Arenas J. Semiautomated measurement of nitrate in biological fluids. Clin Chem 1998;44:679-81. Van Uffelen BE, Van Der Zee J, De Koster BM, Vansteveninck J, Elferink JG. Intracellular but not extracellular conversion of nitroxyl anion into nitric oxide leads to stimulation of human neutrophil migration. Biochem J 1998;330 (Pt 2):719-22. Pollock JD, Koustova E, Hoffman A, Shurtleff D, Volkow ND. Treatments for nicotine addiction should be a top priority. Lancet 2009;374:513-4. Aitchison R, Russell N. Smoking – A major cause of polycythaemia. J R Soc Med 1988;81:89-91. Koubaa A, Trabelsi H, Masmoudi L, Triki M, Sahnoun Z, Zeghal KM, et al. 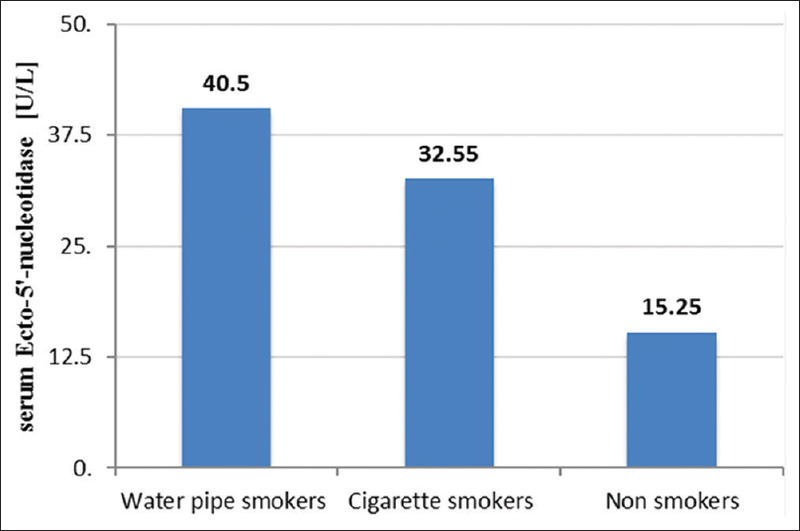 Water pipe tobacco smoking and cigarette smoking: comparative analysis of the smoking effects on antioxidant status, lipid profile and cardiopulmonary quality in sedentary smokers Tunisian. Int J Pharm Sci Invent 2013;2:51-7. Jackson DV, Spurr CL. Smokers' polycythaemia. N Engl J Med 1978;298:972-3. Jain P, Jain R, Mal KL, Mangukiya K. Effect of cigarette smoking on hematological parameters: comparison between male smokers and non-smokers. IJSN 2014;5:740-3. Ritz E, Benck U, Franek E, Keller C, Seyfarth M, Clorius J, et al. Effects of smoking on renal hemodynamics in healthy volunteers and in patients with glomerular disease. J Am Soc Nephrol 1998;9:1798-804. Lindenfeld J, Schrier RW. Blood urea nitrogen a marker for adverse effects of loop diuretics? J Am Coll Cardiol 2011;58:383-5. Ardite E, Peinado VI, Rabinovich RA, Fernández-Checa JC, Roca J, Barberà JA, et al. Systemic effects of cigarette smoke exposure in the guinea pig. Respir Med 2006;100:1186-94. Hecht SS. Tobacco smoke carcinogens and lung cancer – Alterations in the activity of enzymes from the purinergic system are associated with an increase in platelet aggregation due to smoking effect. J. Natl Cancer Inst 1999;91:1194. Hayes JD, Pulford DJ. The glutathione S-transferase supergene family: Regulation of GST and the contribution of the isoenzymes to cancer chemoprotection and drug resistance. Crit Rev Biochem Mol Biol 1995;30:445-600. Bruno RS, Traber MG. Cigarette smoke alters human Vitamin E requirements. J Nutr 2005;135:671-4. Drevon CA. Absorption, transport and metabolism of Vitamin E. Free Radic Res Commun 1991;14:229-46. Bruno RS, Traber MG. Vitamin E biokinetics, oxidative stress and cigarette smoking. Pathophysiology 2006;13:143-9. Leonard SW, Bruno RS, Paterson E, Schock BC, Atkinson J, Bray TM, et al. 5-nitro-gamma-tocopherol increases in human plasma exposed to cigarette smoke in vitro and in vivo. Free Radic Biol Med 2003;35:1560-7. Wurzel H, Yeh CC, Gairola C, Chow CK. Oxidative damage and antioxidant status in the lungs and bronchoalveolar lavage fluid of rats exposed chronically to cigarette smoke. J Biochem Toxicol 1995;10:11-7. Ghasemi A, Syedmoradi L, Momenan AA, Zahediasl S, Azizi F. The influence of cigarette and qalyan (hookah) smoking on serum nitric oxide metabolite concentration. Scand J Clin Lab Invest 2010;70:116-21. Rejdak K, Eikelenboom MJ, Petzold A, Thompson EJ, Stelmasiak Z, Lazeron RH, et al. CSF nitric oxide metabolites are associated with activity and progression of multiple sclerosis. Neurology 2004;63:1439-45. Yamashita T, Ando Y, Obayashi K, Uchino M, Ando M. Changes in nitrite and nitrate (NO2-/NO3-) levels in cerebrospinal fluid of patients with multiple sclerosis. J Neurol Sci 1997;153:32-4. Ischiropoulosd H, Beckman JS, Crow JP, Ye YZ, Royall JA, Kooy NW. Detection of peroxynitrite. Methods 1995;7:109-15. Smith KJ, Lassmann H. The role of nitric oxide in multiple sclerosis. Lancet Neurol 2002;1:232-41. Jeffery DR, Absher J, Pfeiffer FE, Jackson H. Cortical deficits in multiple sclerosis on the basis of subcortical lesions. Mult Scler 2000;6:50-5. Trapp BD, Peterson J, Ransohoff RM, Rudick R, Mörk S, Bö L, et al. Axonal transection in the lesions of multiple sclerosis. N Engl J Med 1998;338:278-85.